Matt is running the Wilson Bridge Half Marathon this Sunday, October 4th. This race is the U.S. Association of Blind Athletes Half Marathon Championship. He won it last year. Since Matt isn’t focused on the half marathon distance right now and is instead focused on shorter distances to get his speed up in preparation for trying for Rio, we’re a little uncertain about his prospects for defending his first place finish, but you never know! I ran this race last year, too, but will be in spectator mode since I will have just done a 20 miler the day before in preparation for the Marine Corps Marathon at the end of the month. October 4th marks the end of a year of firsts for me since my brother Brian died save one – the first marathon I will run without seeing Brian cheering me on. I always looked to my time running, whether in a race, training for a race, or just out on a jog, as special me time. That me time got more valuable with three little ones at home, and often times occurred either very early or very late in the day. It was my time to think and plan or not think at all. I even came up with the idea for this blog while on a long run. I shouldn’t have been surprised, but I was, when I went out for my first run after Brian died and started crying uncontrollably after only a quarter mile. I turned around and went home. I attempted runs a few more times and though when it set in varied, I couldn’t make it through a run without being overcome with emotions. My days are busy and I am rarely alone. I could mostly avoid grief the rest of the time, but not when I was alone. So unless Matt could meet me at lunch to run or a friend could meet up on a weekend, I didn’t run. This went on for months and months. I quickly learned that you can’t shut out grief. If it didn’t come out during a run then it just manifested itself at a different, unexpected, and inopportune time. I started personal training sessions at a gym so that grief didn’t find me by the dumbbells. Finally I realized that maybe the reason I was so overwhelmed with grief during my runs wasn’t because I was alone, but because I was running. Though Brian thought I was a bit crazy for running so much, he always supported me. He never missed a Cherry Blossom 10-miler or a Marine Corps Marathon. In 2009 when I couldn’t run with my running club on an 18-miler, Brian volunteered to bike it with me the next day. And so began a new sister-brother tradition for us. Whenever I couldn’t run with the group, he’d bike with me and wear my water belt and carry my gu gels. When I decided to run a marathon after the twins I wanted to get started before the running groups so that I could still have a lot of day left with the kids. Most Saturday mornings I would knock on Brian’s door well before dawn and we’d go out for our run/bike. Afterwards, we’d stop at the Seven-Eleven by his apartment and get chocolate milk and sit on his front porch and drink them before I headed home. I decided to challenge myself to train for this year’s Marine Corps Marathon. I ran my first marathon in 2005 so it seemed appropriate to run it again 10 years later. The training hasn’t been easy. Physically, I’ve been injured and going to physical therapy for three months now trying to fix the plantar fasciitis in my left foot. Mentally, I’ve been trying to balance the great memories I have of Brian with the pain of him being gone. I’ve been fortunate to have company on many of my long runs. But when I don’t I have accepted that they will be hard, both physically and mentally. I still have chocolate milk afterwards; just now I usually end up sharing it with kids. I miss him every day. 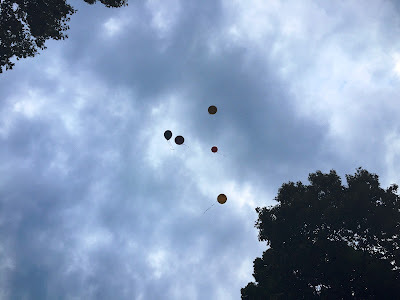 Emily thought we should send Uncle Brian balloons in heaven on his birthday...so we did. My next post will be all about Matt's half marathon on Sunday! !